It is time to “warrior up” according to Suzanne Patles of the Mi’kmaq Warriors Society. 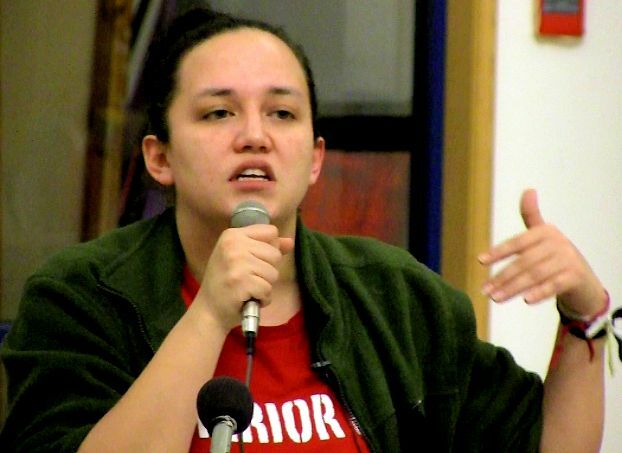 She spoke at Thunderbird House in Winnipeg on Feb. 17, 2014 as part of a national tour to raise awareness about the struggle at Elsipogtog First Nation against shale gas fracking and police repression, as well as their ongoing assertion of nationhood. Their blockade in opposition to shale gas fracking at Elsipogtog First Nation (located in Kent County, New Brunswick) came to national attention on October 17, 2013 when the it was attacked by dozens of RCMP officers armed with assault rifles, pepper spray and dogs. Forty members of the blockade were arrested, and a number of members of the Mi’kmaq Warriors Society face charges. Seen at the opening of the video is the Keewatin Otchitchak Traditional Women’s Drum Group, which performed at various times during the evening. The Winnipeg stop of this national speaking tour was organized by the Council of Canadians-Winnipeg Chapter, Boreal Forest Network, Thunderbird House, Winnipeg-Indigenous Peoples Solidarity Movement, Aboriginal Youth Opportunities and the Canadian Union of Public Employees (CUPE).